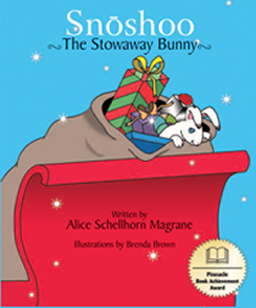 Snoshoo the Stowaway Bunny is a delightful Children's Christmas book, written in verse, by author Alice Schellhorn Magrane of Haverhill, Massachusetts. This Christmas story will be cherished by parents and children for many years to come! On Christmas Eve at the North Pole, an adventurous young bunny with very big feet is eager to escape the teasing of the other bunnies. When he meets Dasher the reindeer and learns about Santa Claus' Christmas Eve ride, he sneaks aboard the sleigh and changes his life forever. This magical and heartwarming Christmas book, written for children from preschool-aged to those in elementary school, teaches self-acceptance, acceptance of others' differences, and conveys the spirit and joy of Christmas. Alice Schellhorn Magrane holds a master's degree in education and a bachelor's degree in French from Tufts University. She spent most of her 30-year career in public education as a guidance director in Massachusetts and New Hampshire. Upon retiring in 2008, she chose to combine her lifelong love of verse and literature by authoring a Christmas book about a special Arctic snow hare. Magrane remains actively involved in education through her work as a private college counselor. She also donates a portion of the sale of each copy of Snoshoo the Stowaway Bunny to the Doug Flutie Jr. Foundation for Autism. To make Snoshoo one of your child's favorite Christmas books, click below to purchase a copy in paperback or Kindle version at Amazon.com. Snoshoo the Stowaway Bunny was named a 2011 Pinnacle Award Winner. Contact us today to request more information on ordering a signed copy of this Christmas classic, personalized for your child.